Easterly Parkway Elementary School students enjoy moving through a fun and colorful sensory walkway. Easterly Parkway Elementary School’s colorful sensory walkway does more than enliven a hallway. The winding, looping course brightens days by offering a change of pace for students. 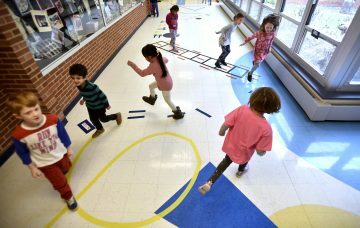 Following the taped path, they can walk on their toes, raise their arms, push against a wall, leap through squares, twist and crouch — a bit of exercise between lessons, after lunch, during indoor recess or en route to the bathroom. Courtney Simpson, an autistic and emotional support teacher, came up with the idea after reading about the popularity of sensory walkways in European schools and communities. Initially meant to give her students movement breaks, the walkway has become a popular destination for the entire school, with “go do the lines” now a frequent invitation. “There are rules to follow — no bumping or jumping on top of people — but it’s basically go have fun,” Simpson said. “Go get that movement, get your energy out and then go take a test or read.” The walkway mixes stepping with raised hands, jumping across lines, zig-zagging, leaping across shapes, negotiating a hopscotch medley and duck-walking.